“Is the Crow a Bad Bird?” is a delightful story that shares a fun little adventure of a curious crow. It helps young readers know more about the behavior and characteristics of this interesting bird. The author weaves an interesting and informative story about a curious crow that will appeal to many readers of all ages. David Omondi is a wide reader and creative writer whose knack for storytelling took inspiration from the folklore and stories told by his grandmother when he was young. He believes that his stories are worth telling, too. Therefore, he crafts interesting stories that will appeal and delight many young audiences everywhere. 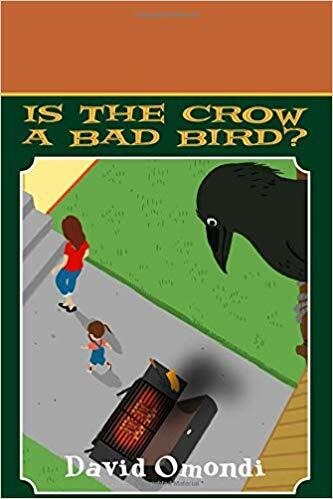 This time, he weaves an interesting and informative tale in “Is the Crow a Bad Bird?” As the author narrates the story, readers will first find Rosemary and the crow fighting over what she’s cooking on her hot grill. Despite her efforts, the crow ends up outwitting Rosemary’s intelligence and made fun of her. Throughout the book, the author effectively describes to his readers what the crow does best—peep and peck. ”Is the Crow a Bad Bird?” is truly an interesting read for readers of all ages. This book was one of the titles displayed during the 2018 Miami Book Fair International that ran from November 11-18, 2018. Is the Crow a Bad Bird? David “Ovid” Omondi is a prolific writer and avid reader. He is a native of Kenya who came to America at the beginning of the millennium. He was inspired by storytelling and folklore from his grandmother and mother while young. According to him, he stated, there are so many stories that were told but have remained untold and unheard. David grew up in a village where he came across a lot of creepy living things and animals in the habitat. David is also the author of “Benedict and the Magic Chameleon” trilogy (“Benedict and the Magic Chameleon,” “Benedict Meets Leila,” and “The Dark Planet”), “The Crow is a Smart Bird,” and other works yet to be published. His creativity and inspirations stem from working with children in both the public school system and in a children’s village. He has also studied Psychology and worked in a psych unit, dealing with those having behavioral issues.